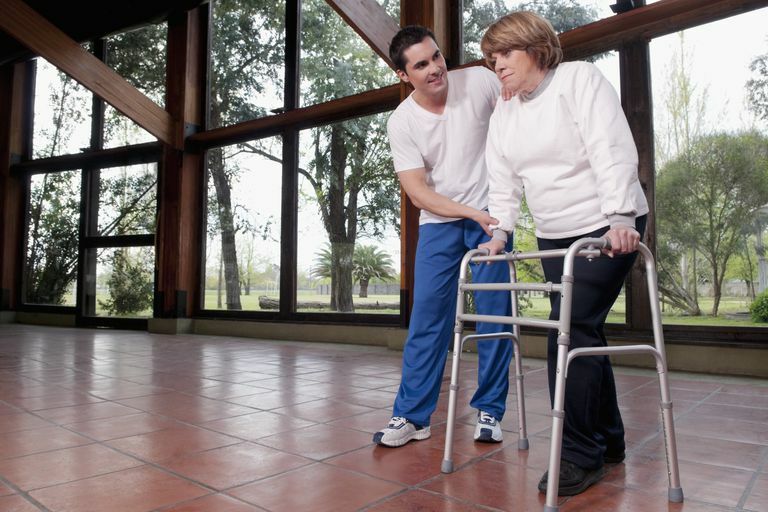 Functional mobility describes a person's ability to move around in his or her environment. Examples include walking, scooting along a bed, and rising from a chair. If you are injured or ill, you may have a difficult time maintaining normal functional mobility. That's where your physical therapist comes in. After a period of immobilization or after injury or illness, you may notice limitations in your ability to move around. You may need the assistance of another person to move in bed and get out of bed, to move into and out of a chair, or to walk. You may also require a cane, walker, or another assistive device to help you maintain your balance and walking ability. If you are hospitalized, a physical therapist who works at the hospital may come to evaluate your mobility to ensure that it is safe for you to return home. If injury or illness prevents you from leaving the house, a physical therapist may come to your home to assess your functional mobility. While at your house, the therapist can also provide ideas to help make your home environment safe for mobility. Where Does Functional Mobility Take Place? Basically, anywhere a person can move about can be considered in describing functional mobility. The three main areas of functional mobility that your physical therapist may evaluate include bed mobility, transfers, and ambulation. Bed Mobility: This is your ability to move around in bed, including activities like scooting, rolling, or moving from lying to sitting and sitting to lying. Your ability to move around in bed may be limited and you may require assistance to move. Transfers: Transfer refers to the act of moving from one surface to another. You may need assistance when moving from a bed to a chair or when moving from one chair to another. Ambulation: This is your ability to walk. You may require assistance from another person or an assistive device, such as a cane, to walk. Your physical therapist may also perform a gait evaluation to analyze the way you walk and to provide strategies to improve ambulation. What Are the Different Levels of Assistance? Dependent: During dependent mobility, you are unable to help at all. Your physical therapist or another healthcare provider will do all of the work. Maximal Assist: Maximal assist means that the physical therapist performs about 75 percent of the work during mobility and you perform 25 percent of the work. Moderate Assist: Moderate assist is a level of assist where you perform about 50 percent of the work necessary to move and the physical therapist performs about 50 percent. Minimal Assist: Minimal assist means that you perform 75 percent of the work to move and the physical therapist provides about 25 percent of the work. Contact Guard Assist: With contact guard assist, the physical therapist needs to merely have one or two hands on your body but provides no other assistance to perform the functional task. The contact is made to help steady your body or help with balance. Stand-by Assist: During stand-by assist, the physical therapist does not touch you or provide any assistance, but he or she may need to be close by for safety in case you lose your balance or need help to maintain safety during the task being performed. Independent: This situation is one that every physical therapist hopes their patients achieve. This means that you can perform the functional task with no help and you are safe during the task. Understanding the different levels of assistance can help you know what your needs may be if your functional mobility is limited. Your physical therapist may also make note of various extra help you require when moving around. He or she may indicate that you require tactile cues to remain safe. This means that your PT is using his hands to guide you along. Verbal cueing means that you require someone to make gentle verbal reminders about the technique you should be using while moving around. If you are experiencing limited functional mobility, your physical therapist can help you improve it. Practice makes perfect. Your PT can show you different motions to practice that can improve your mobility. Your PT understands how to break down different components of mobility, and he or she may have you work on perfecting these individual motions that, when put together, equal optimal functional mobility. Your PT can decide which exercises are best for your specific condition. Sometimes, simply practicing the correct way to move about is enough to improve muscle memory and help you get around more safely. Your functional mobility may become impaired when you suffer an injury or illness. Muscles may become weak, your balance may be impaired, or muscular spasm and pain may limit your ability to move. Your physical therapist can help determine your current level of function and the assistance that is needed to keep you moving safely. By understanding various levels of assistance, you can help improve your mobility and functional independence. OSullivan SB, Schmitz TJ, Fulk GD. Physical Rehabilitation. Philadelphia: F.A. Davis Company; 2014.